Artist Statement Whatever work I am creating, it seems to be more about emotion and relationship than strictly a representation: more subjective than objective. There's something the world gives to me as I first experience it and then as I create my art. I hope my work somehow reflects something back to the world that is worth remembering. There is a language that speaks to me visually, and it is that conversation that I strive to reveal. Visit Terlingua Visual Arts on Facebook! 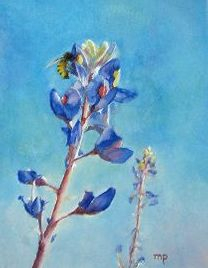 Biography Mary Diesel is an active artist and steering committee member of Gallery on the Square in Alpine. From 2016 - 2018, she was facilitator for Terlingua Visual Arts, a non-profit committee which promotes artists and their work in south Brewster County, Texas. When she is not painting, Mary is desert hiking, practicing bass guitar, making soup or singing karaoke. Her art expresses her connection to the world through a kind of "permeable boundary," one that can maintain and enrich relationships without losing herself in them. 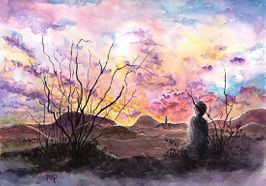 Her watercolors and acrylics reveal that close bond to her surroundings. Her ceremonial breastplates made from cast paper pulp, fibers and mixed media manifest that symbolism and convey the beauty of her desert surroundings. Mary lived in Terlingua most of her years from 1994 to 2018. In 2009, she returned to her love for watercolor painting, and began studying with Virgin Island artist Jane Akin. 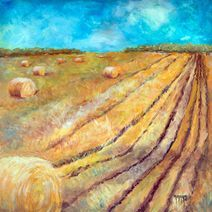 She painted two seasons with the St. Croix plein aire group, The Palletteers. In her watercolors, she captures moments from her daily living, where she finds quiet moments tucked into the active lives of people, animals and the environment. 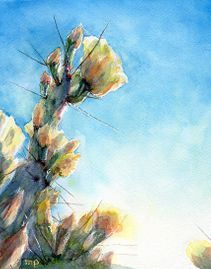 Mary now resides in Las Cruces, New Mexico and is a member of the New Mexico Watercolor Society - Southern Chapter. watercolor paintings and four breastplates. Exhibited four watercolor paintings and three breastplates, featuring “The Eyes of Jump Up.” The annual exhibit is one of the major fundraisers for The Good Hope School. “Off Season at the Waterfront” was used for poster art. Four paintings were purchased by the St. Croix Chamber of Commerce to be given as awards at their annual ceremony.